What to do with Philippine education, which has gone on a tailspin for a couple of decades now and is stretching the knowledge gap between this country and its neighbors? I've read several interesting proposals of late, which have to do with revising the curriculum, improving teacher-student relationship, changing the pedagogy or teaching method, and expanding the range of the pedagogical environment beyond the classroom to include the home, the media, and so on. I have my own proposals, which I think will go farther toward improving the enlightenment of this country. Or at least keep us from lagging further behind our neighbors. They have to do with the lessons we are teaching the country today. These are my three proposals for education: First, improve the plight of the public school teacher. I can't see how we can make any headway in education in this country unless we improve the status of the public school teacher. In my time, teachers, public or private, university or nursery, commanded the absolute respect of the community. They were greeted deferentially on the street and given seats of honor on stage in important social events. Today, well, teachers measure even less than writers. I still remember what a BIR man told me when I appeared at his office in the early 1990s to settle my back taxes. "Ay, writer ka lang pala," he said completely dismayed. I can imagine what he said about teachers. The movie "Mga Munting Tinig" got it right: Public school teachers, particularly in far-flung areas, are people who teach while waiting for their application to become maids or dancers abroad to push through. Indeed, who teach as an emergency measure, to occupy time between dancing or scrubbing floors abroad, the way show bands play local beer gardens between gigs in Asia. Pamparaos, or a way to get by. What are we teaching the country with something like this? Nothing more or less than that education, or being its guiding light, is a road to perdition. We can try to improve curriculum, we can change pedagogical methods, we can build more classrooms, but we treat teachers in this way and none of it will matter. The best way to teach, as we all know, is by example. You cannot teach your kids the virtues of honesty, integrity and responsibility, however much you try to drum the lessons into their heads with the lash of the belt on their butts, if you yourself are a hustler, a crook and a lush. The same is true here. You cannot teach kids to value education if they see the pillars of education trashed in this way. The public school teachers themselves say wryly that they have replaced the carabao as the national animal. Before anything else, give the teachers better pay. If we can give soldiers increases in pay because they defend the physical life of the nation, we can give teachers increases in pay because they defend the spiritual life of the nation. The second is far more important than the first. I propose completely seriously giving the salaries and emoluments of Cabinet officials and congressmen to the public school teachers. Teachers mold minds, Cabinet officials and congressmen only screw them. 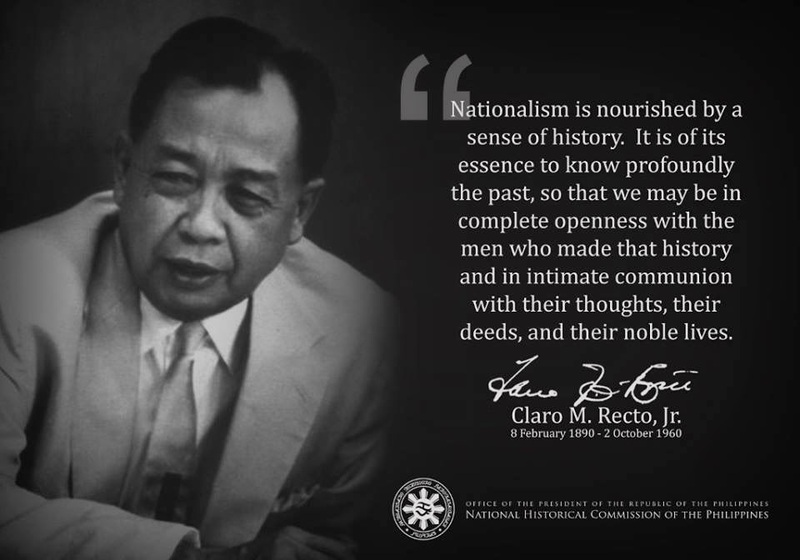 Second, teach Philippine history to every Filipino, not just the kids. I'll wager that if you give a test in Philippine history to the residents of Malacañang, the Senate, the House and the judiciary, more than half of them will flunk it. I half-suspect that if you ask the same people to sing the National Anthem and recite Panatang Makabayan, the majority of them will flunk it. The reason this country has no future is that it has no past. The Jews were cursed to rove for ages because they did not have a home to pitch a tent in. Filipinos are cursed to rove for eternity because they have a home but do not have the eyes to see it. History is the thread that leads back home. The current Filipino Diaspora is not the disease, it is a symptom of the disease. Long before Filipinos live physically abroad, they are already living mentally abroad. Or specifically in the United States. Our concept of globalization, far from being a mark of sophistication, is a mark of parochialism. It has nothing to do with the globe, it has to do with America. We imagine ourselves global because we watch the NBA and listen to hip-hop. History is the one lesson that has been lost to us all these years. The knowledge that we weren't spawned from a kawayan, as the myth goes, but were forged from the smithy of struggle is the one legacy we have spurned. Ask Rizal what happens to people who do not know where they came from. In any case, where's the point of making the educational system world-class if all it will do is produce doctors who will want to work as nurses in Los Angeles or Toronto? My last proposal, and the most important one, is to get rid of Gloria Macapagal-Arroyo posthaste. Nothing can push back ignorance and benightedness in this country more than that. What is the point of education? It is not just to give people a wealth of goods, it is to give people a wealth of possibility. It is not just to give people a breath of fresh air, it is to give people a breadth of spirit. It is not just to give people a set of skills, it is to give people a sense of purpose. What is the point of Arroyo? She is the refutation of it all. She represents the constriction of possibility, the meanness of spirit, the laying low of lofty purpose. You can try to fill the youth with ideas about justice and goodness and wisdom, but so long as Arroyo is there, they will learn only that their elders do not practice what they preach. Or that those who can't do teach. We want to teach this country decency, dump her.It's a basic lesson in good manners and right conduct.